Fresher than a gumbo popsicle. THE SCENE: In spite of the nearly infinite song possibilities of both jazz and hiphop, I find jazz-hop to be universally underwhelming. (Except for this one, but you knew that already.) Usually one genre is sprinkled on top of the other like salt on a bagel, resulting in either jazz songs with with b-level raps or hiphop songs with acoustic bass loops. Herbie Hancock’s “Rockit” is one of the few classics of both genres, and even that track is rap-free. 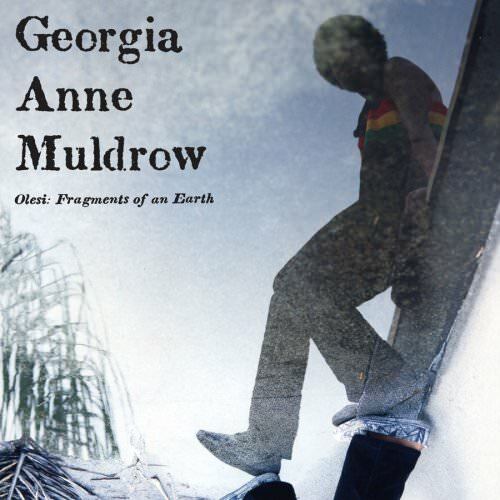 But vocalist and producer Georgia Anne Muldrow took a completely different angle, puréeing the surrealistic essences of both free jazz and hiphop beat chopping, whipping up the freaky soufflé into her debut album Olesi: Fragments of an Earth. If The RZA remixed Jill Scott but left the tracks in the oven to melt, that’s but a morsel of this albums’ sound. Muldrow’s jazz-scented vocals are layered frosting-thick but it’s her plate of rhythms that’s the real standout. Every song has a woozy bottom of micro-beats that ripple up like Ovaltine chunks, rendering the standard 4/4 beat undanceable and unrecognizable, yet totally fascinating. Sandwiched between these slices are a buffet of musical styles, all of which get blended and stewed. The hemp-filled “Radio WNK” rolls in some reggae, its drums sounding like groceries dropped to the floor. The funk reduction “Birds” percolates on chocolatey bass pops and tin can hits. “Melanin” seasons an electronica soup with some fierce jazz scatting. Muldrow reaches an apex of sonic collage with her unique social report “New Orleans”. With it’s first lines (“Murderer…Humans left alone to die”) it’s a devastating menu of marching snares, pianos smears, and anger. You can smell the fear and confusion of watching a town sink under the flood waters, and the taste the rage of indifferent government support. Her only nod to mainstream music is with song length, as nearly every track is a bite-sized two minutes. Just long enough to get some radio spins. Er, not. THE FALLOUT: Reviews were decidedly mixed: critics who appreciated dope-fiend beats (like hiphop writers) tended to be kinder than one who didn’t (like indie rock writers). Sales were minimal. Although she’s released some collaborative material since, she has yet to release a follow-up album. A skillet full of spices, sauces and steam, Olesi: Fragments of an Earth is a full-course meal for the challenging palate. NEXT WEEK: Mr. Busdriver’s Wild Ride. Wow! You NAILED my feelings about this project. Georgia’s soundscape is her genius. and im really feelin this lady.